It’s the moment we’ve all been waiting for since Joe Lycett shared ‘that‘ picture on Instagram in April last year. That’s right people, Sewing Bee is offically back and we even have a date – 12th February 2019 on BBC 2. We couldn’t really couldn’t be more excited and so here at Sewisfaction HQ, we’ve created the Sewing Bee Sew along, a weekly challenge that involves the whole of the sewing community. We’ll be revealing more information over the next few weeks, but for now, here’s how it’ll work. 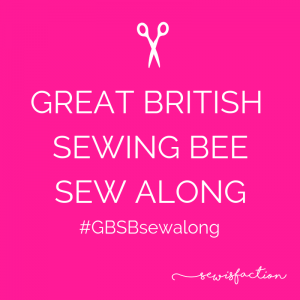 If you’ve watched Sewing Bee before, you’ll know that each week, the participants are given a theme which can be anything from occasion wear to upcycling old clothing – that’s where #GBSBsewalong comes in! As you watch the episode, you’ll have the chance to get inspired by the theme which will be the sew along challenge for the next week. We’ll even help you along the way with lots of inspiration from our blog and Instagram stories. During the show, we’ll share all our favourite entires over on Instagram stories (of which we’re sure they’ll be LOADS) and at the end of the episode when Patrick and Esme reveal their winner, we’ll reveal ours – simple. As usual, we’ll be working with the amazing sewing community to make sure there are some incredible prizes for the weekly winners – watch this space for more on that in the coming weeks. We’re all about loving slow sewing and taking things at your own pace, so don’t panic, we’re not expecting you to create a brand new ball gown in a week (although that would be impressive!). What we’re looking for is an innovative sew, perhaps it’s something in your stash you’ve been meaning to get round too for years or a UFO that you know you really should have finished a while ago! As sewers, we know that one of the most amazing things about our hobby is the community and over the next few months, that community is going to grow with lots of sewing newbies, inspired by the amazing programme. We want to show them that sewing isn’t just about making amazing clothing (and we mean amazing) but it’s about the fantastic group of sewists that like, share, chat and sew along with us every day. The Great British Sewing Bee might only has room for a limited amount of sewers on TV, but the realms of Instagram are endless so we can’t wait to watch everyone get involved! Keep an eye out on the blog as well as our social channels for more exciting announcements including prizes, inspiration and of course – the challenges. What a fantastic idea, looking forward to getting involved. Ooooh this is going to be fabulous. Thanks Sewisfaction. I thinks it’s time to take up the challenge, from Australia though! I would like to join you, but I’m living in Germany. What do you think? Possible? Lovely idea. Might be what I need to kick start my sewjo which winter and the flu has stolen from me. This sounds fab! Would love to get involved! How can you see the show outsider the UK? Sounds fun – I’m in! Just found this site. Great idea! I’m going to try and keep up just to see how I do. I’ve never completed anything to wear before so it will be a challenge. This is such great news. Made my day to know it’s coming back! I’m really looking forward to new series! Excited to check this out! Do you think I’ll be able to watch it in America? So pleased Seeing Bee coming back on, look forward to getting inspiration! Excellent idea, practical viewer participation , building skills and gaining from each show. I’m ready to get super creative ! Yes please would love to join just need to get a Instagram account ! Ooo hoping to get involved! I’m joining! Even though I’m traveling, I can’t let this opportunity slip by. So excited for this and #GBSB yay!!! I cannot wait! Missed it, and there’s SO many cooking programmes tv needs other skills!!! I would love to join in with you’re GBSB it sounds like great fun. I think we would also learn a lot from it. Put my name down please. I want to know what the prizes are going to be!! I’m excited to join. However I’m not sure if we here in the U.S. will have access to the show. Still would like to share in the themes and sharing creative ideas/works. Only recently I have been watching the previous episodes: and I LOVE IT!! Such a same that a program like that isn’t up in the Netherlands anymore 🙄. The challenge sounds like fun. I am in! Sounds like fun! I would love to join in. Yippy!!!! Cant waite, been sewing since i was 12 . O learn every time i watch these shows. Oh yes ! Can’t wait! You are so welcome! Thanks for joining in and have fun! I am so up for the challenge, especially that it is sewing. Getting a lot of sewers out there like myself that I want to be part of the show. No more ****hole (Primark *rap). I’m sorry but not sorry. The public needs to recognise that there are talented sewers out there. It is more about the talent sewers, also who are wanting to make a change in sewing, tailoring and clothes on the high street for sure! 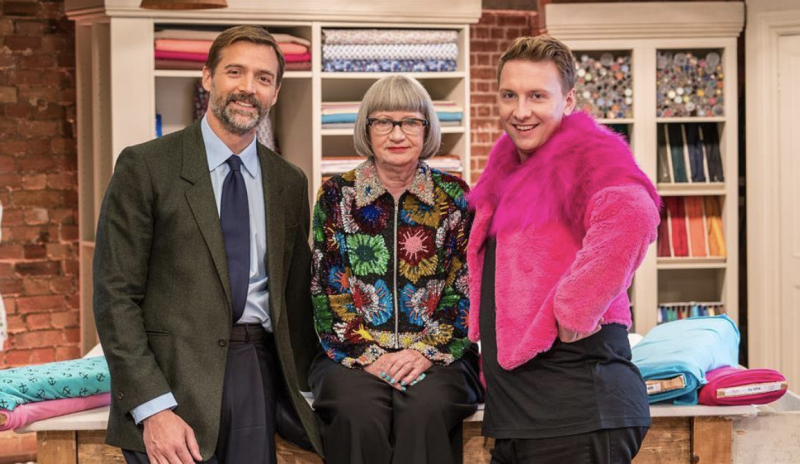 I am so up for The Great British Sewing Bee Sew Along Challenge!! Mark my word!!! Can’t wait for GBSB tomorrow and definitely up for taking part in the challenges! I’ll be watching from the US and so will be watching when I get home from work in the evening, so a few hours after all of you (unless I can hide in the store room with my iPad). I started sewing again after 25 years away because of the Bee! This is a great idea – looking forward to joining in! I’ll try and join in – time/work permitting! Great idea, but I don’t know how to use Instagram? Does this matter? You can join in the challenge for fun and not post any pics! But to be entered for the prizes you will need to post a photo of your makes on Instagram, we have to have a way of seeing them all each week. It’s very easy to set up an account if you want to and there are thousands of amazing sewing lovers on there! I will be joining you. I don’t understand how to take part on the challenge. Do I have to subscribe oder post pictures of my mekes…? I’m joining you in this challenge. I’m really looking forward to it. Thanks for organising. I’m joining in and looking forward to it. Thank you. I’m joining in and thank you. Sew satisfaction you are doing a fantastic job with these GBSB challenges.